Liberty Hall as it stands. 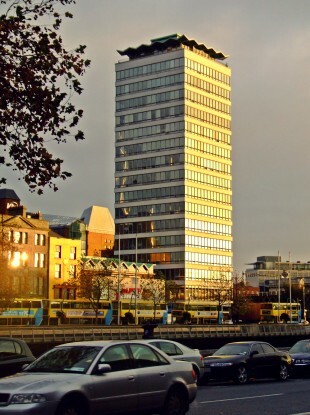 THE TRADE UNION SIPTU has said that it intends to demolish the 17-storey Liberty Hall in Dublin and rebuild a 22-storey building after Dublin City Council granted it planning permission. The council has set down 19 conditions including further alignment of the north side of the building particularly on upper levels, RTÉ reports. The decision has been welcomed by SIPTU with the new tower to be 35 per cent higher than the current historic structure. The council received a number of objections to the proposal mostly citing its height. An Bord Pleanála will now consider the proposal and objections can be lodged with it within the next month. The union has not revealed how much it will cost. The new building will include 17 storeys for office and meeting room space and five floors for “public and cultural purposes” which will include a double-height public entrance area, a theatre, conference centre, a heritage centre, and a sky deck which will provide panoramic views of the city. The union claims that the construction phase of the new Liberty Hall will generate as many as 200 jobs and that the new public facilities will make the new tower “a premier attraction”. “The proposed re-development process, if approved, will be largely self-financing and won’t involve any cost impositions on the union’s members,” a statement said. Liberty Hall was completed in 1965 and the site is historically linked to the 1916 Rising where it acted as a munitions factory prior to the rebellion. Leaders assembled there prior to their march on the General Post Office on Easter Monday. It is currently the third-highest building in Dublin after Montevetro and the Millennium Tower in Grand Canal Dock. “The building has remained largely unchanged since 1965 and the dysfunctional nature of the space and how it is configured has meant that re-development is the only way forward. “SIPTU also wants to substantially improve the environmental performance of Liberty Hall in order to reduce running costs and cut the union’s carbon footprint,” the statement added. Email “SIPTU set to demolish and redevelop Dublin's iconic Liberty Hall ”. Feedback on “SIPTU set to demolish and redevelop Dublin's iconic Liberty Hall ”.